I've removed any filters I had thinking they were messing it up. I also need to select items greater than 10 in the Job Field and drop the rest. Last edit: by Ken Starnes. when I changed the input type to string (on the left hand side) the output is formatted correctly. Doesn't seem logical to me. I suppose you´re using quotation marks and in the TextFile Adapter on the WRITE side you´ve configured that quotations marks should only be used for data type STRING? In case when your number format are with an comma as group delimiter and your CSV delimiter are also comma you get this result. For example your staff_id is greater than 1000, the number are outputed as 1,000 (including comma). In this case the output are not quoted and you see in your output an additionl column. 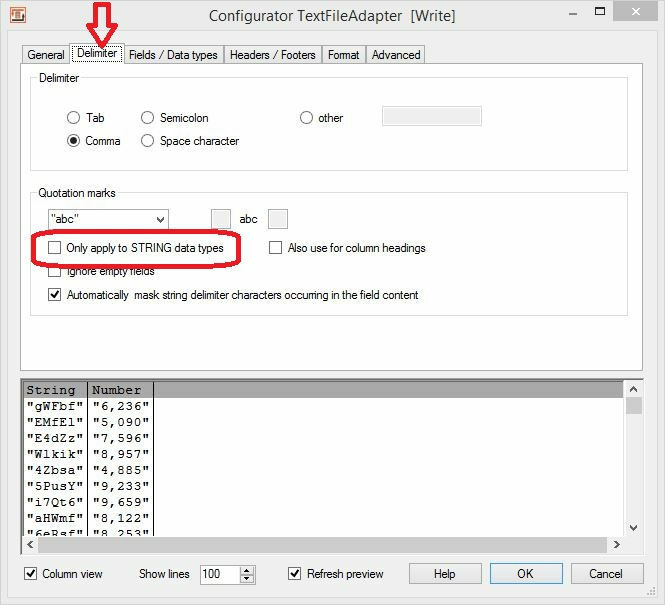 To solve this issue it should be enough the disable the quotation mark option “Only apply to STRING data types” in the TextFile Adapter on the Delimiter tab, see screenshot below. 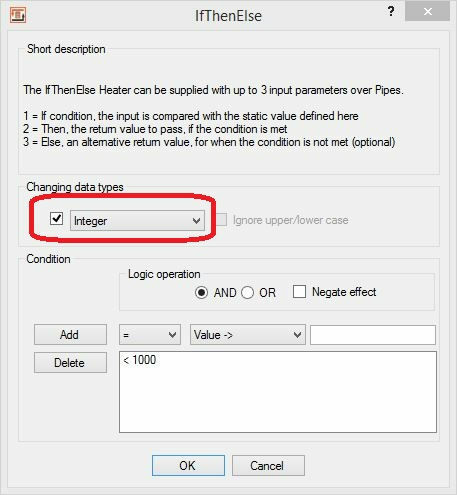 To filter records you have to use the Filter Heater in combination with an IF-THEN-ELSE Heater for the filter condition. In the condition you have to change the compare data type to INTEGER and set to condition to the desired one. For example < 1000 that’s all. I´ve made a short example to demonstrate this. In this example I included also the quotation mark issue.